Area S-14 is the fourteenth course of Rainbow Summit and the eighty-seventh course overall in Mario vs. Donkey Kong: Mini-Land Mayhem!. The Mini Marios all begin along the bottom area, all somewhat adjacent to each other, with the exit door on the bottom left. In order to reach it, they must simply be guided via a series of Blue Ladders and Cannons to it while avoiding Shy Guys. The M-Token is located at the top right, in an alcove on the upper level near a Shy Guy. To collect it, a Mini Mario must fire right from the Cannon all the way from the top left. The Mini Mario Card is located at the bottom right, in an alcove on the lower level. 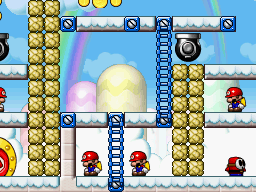 A Mini Mario must use the Blue Ladder over to the left and grab the Hammers before falling down the ledge to it. In order to earn a trophy, the player must score 12300 points.